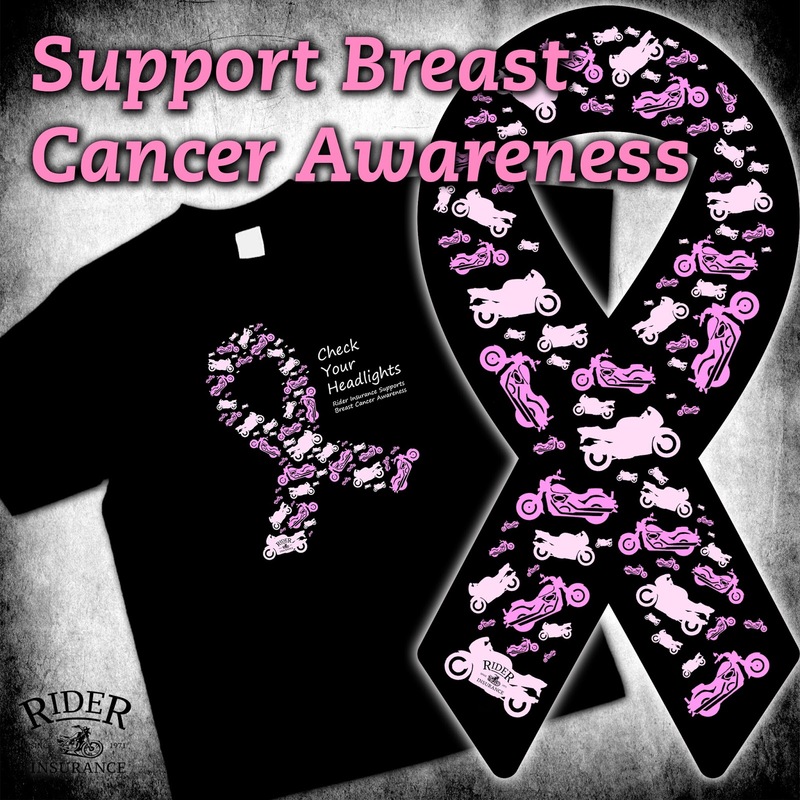 Thank you to all who purchased shirts and magnets for our Breast Cancer Awareness Month promotion! We raised over $2500 dollars in donations for the Breast Cancer Research Foundation! Did you know that September is Childhood Cancer Awareness Month? 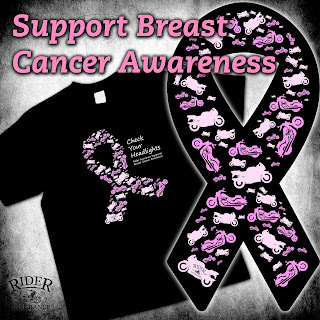 Help Rider bring awareness to the cause and complete an entry form here: http://bit.ly/1KqCh4m. Share to get another entry. The winner will have $200 donated in his or her name to The Cure Starts Now Foundation. The Rider Insurance Bleiwise Family Foundation will also donate a dollar for every new like in the month of September to The Cure Starts Now Foundation. Works with: Instagram, Tumblr and Twitter. Several years ago - 2010 or 2011 or thereabouts - as a relatively new and less experienced rider, I went for a 50 mile joyride with my wife on the back. At the time our bike was a 1998 H-D Fat Boy. A hurricane remnant (not usual for Indiana, but this one had spun all the way up here!) was nearby but not expected to affect us. Well, it did. 10-15 miles into the ride we got slammed. Hard, pounding, can't-see-across-the-road rain and heavy winds started without much warning, and honestly, I panicked. I wasn't sure I could get us safely though the storm, but my wife just yelled "ride on" and so I did. I'm still not sure how I pulled it off, but I made it to the small town (Attica, IN) that is sort of the halfway point of the ride. We stopped on Main St. to catch a breath and see if the storm was going to diminish. It didn't, so we had no choice but to ride on through it and finish the ride home. Obviously, we made it safely, but that is easily the most scared for my life I've ever been on a motorcycle. I learned a lot about riding that day. Too many stories to pick just one....our ride home from the Wildwood rally watching the black clouds as we headed north and getting caught in a downpour and having to sit under a bridge with a dozen other riders.....our rides in Florida, going in and out of rain storms, never taking rain gear off because of the next one approaching....the one Florida trip when we left in November DURING a cold rain storm, being drenched to the skin and shivering when we made our first hotel stop....our trip to the Sturgis, SD rally at the end of July, leaving in the rain and having to wear rain gear all the way out because it was wet and chilly....one trip to North Carolina that we had to turn back after we went over the Susquehanna River on 95 because the rain was so bad and visibility was basically zero....or our trip to the Gettysburg rally and having to wait under a bridge on Route 30 across from The Shoe House, sitting and waving at vehicles while waiting for the rain to let up....like I said, way too many to pick just one. There is no real way to stay totally dry when riding a bike, unless you opt for a car. The one thing I wish motorcycle helmets had were windshield wipers and drip shields to keep the rain from going down your back, that is the worst feeling when you are riding and the water keeps dripping down your back, making the ride even more uncomfortable AND I AM THE PASSENGER!!!!!! But I wouldn't give up riding just because of a little rain, these stories are what makes riding unforgettable and FUN!!!!! Every ride brings some kind of new adventure!!!!! BRING THEM ON!!!!!!! 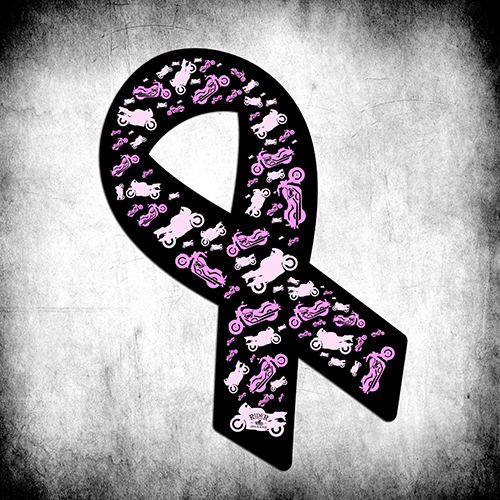 Be safe and keep riding!!!!! We've raised a total of $1056 to be donated towards autism research! Thank you to everyone who participated! Is your bike filthy? Are you getting ready to ride? Here’s your chance to give your baby a bath and get ready for the season. Enter to win a weekly S100 Detailing Kit: http://bit.ly/1wve9cd.